We stayed in the Rocador Playa, which is used for accommodation only, reception, restaurant and bars are located in the hotel Rocador. Both hotels have their own pools and you can use either. Location is excellent and the main reason we booked as we stayed several years ago at the Rocador, furnishings were the same and now it is in need of an update and is looking dated and tired although some may find it charming and quirky. Many nationalities were staying at the hotel. Cleanliness was fine with rooms serviced daily. The dining room can be busy after 9am, so for a relaxing breakfast eat early, although the bacon was very fatty, lots of other things to choose but we like our full English. Staff were friendly and could not fault them. Never watched the entertainment but something is on in the Rocador bar a few times a week. Overall if you want a perfect location in Cala Dor and book room only or bed and breakfast for a cheapish price you can't go far wrong. Once we had arrived at hotel we were told the hotel was fully booked, they paid for hotel for one night at the Cala Gran close by with taxi to return the following day, as it was night this was all I needed, but on return in the morning was pleasantly surprised the room I had was lovely. I had a TV in the room but no English channels, I opened the balcony doors to have the most fantastic views of Cala Gran beach. The hotel pools and indoor pool were very close by, and the gym newly built. The breakfast was amazing and plenty of it, however the evening meal was very samey, hardly any other English people. Overall though a very lovely hotel, in and close to the resort, would recommend to stay again any time. the location of the hotel is beautiful especially if you get a sea view. five minute walk from the centre of cala dor. beach beside hotel. breakfast was fine, nothing special but hot and plenty. rooms were fine, a bit old fashioned but nothing was falling apart and kept very clean. cleaners in every day. we didn't use reception very much but they seemed very nice. this hotel caters mostly for germans but do not let this put you of. pool quite small so get down early, same with beach. you can put your towells out first thing at the beach as the money is not collected until later in the day. entertainment is fine on the two nights they have it, they do not claim to have entertainment every night. We have just returned from this hotel, there are two adjoining hotels the Rocador & Rocador Playa, we stayed in the Rocador Playa. The situation of the hotel is excellent being right next to the resort centre. It also overlooks Cala Gran beach & has direct access to the beach. There are five floors so if you want a sea view I would suggest you ask for a room on at least the 3rd Floor. We spent most of our time at the pool area at the Rocador as this was better laid out & had a larger area than at the Playa. In general the Playa was inferior to the sister hotel in all respects. The main downside to the hotel was the food, this was very poor & this was made worse as we had a child (4 years) for which the choice was very limited. The majority of the guests at the Playa were German & maybe the food is more geared towards their tastes. Not a 3 star hotel the rooms were furnished to 2 star at best. One example is the light fittings where there was bare exposed wiring, cracked insulation, easily accesible to hands. The food was poor, undercooked especially the bacon and sausages for breakfast. The restaurant was hot and airless, salad things disappearing & not replaced over an hour before the end of the restaurant opening hours. The bar was little used which was strange as it had a splendid view over Cala Gran thru the pine trees. The swimming pool seemed to be well cared for but the surroundings were cramped with a small grotty bar. 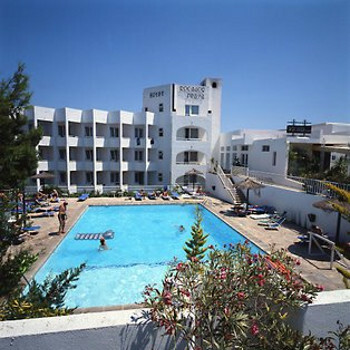 The hotel is in a good location right next to the beach and the main centre, useful considering the food. The sunbed pilots preferred the terraces on the beach side of the hotel.